In 2005, Trees For Life devoted much time and effort to producing a Moringa booklet and pocket brochure about the benefits of the Moringa tree in relieving nutritional deficiencies. The contents also provide information related to ground cover, silage, and fuel, precisely in those geographical locations most in need of environmental and health benefits. The pocket brochure displays the benefits in a very picturesque and easy-to-understand format and is provided free to those who want to learn and share information about the Moringa tree. One challenge in this process of sharing is that the pocket brochure, needs to be available in the main languages of the world. Recently, a Spanish translation of the pocket brochure has been completed. The brochure is also available in Yoruba, Luganda, and Hindi. French and Haitian Creole translations are in process and should be soon completed.. Trees for Life invites individuals throughout the world who would like to make use of the brochure in their region or country, to provide additional translations. The more translations available, the more good that can be accomplished. 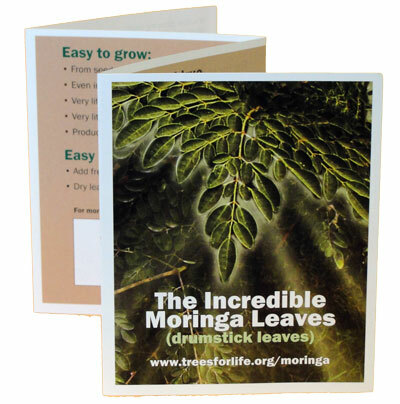 The pocket size brochure and a useful educational poster can be viewed in several languages at the following site: http://www.treesforlife.org/our-work/our-initiatives/moringa/moringa-materials. If you would like to translate the Moringa brochure into another language, we will then post it on our website, www.treesforlife.org. To translate the brochure, go to the following page, which has the text and explains the process: http://www.treesforlife.org/our-work/our-initiatives/moringa/moringa-book/create-your-own-moringa-brochure. After the translation is completed send it to info@treesforlife.org. The changes to the document will be made by the Trees for Life office, and it will be posted on the Trees for Life website so all will have access to download and print the translated copies. Help Trees for Life continue to provide materials for those seeking better, sustainable lives for themselves and their families. In January of 2012, James Kishlar, the director of Agro-forest Regional Nursery (ARN), an organization whose aims are to plant trees, broaden crop diversity, and expand job opportunities in Haiti, contacted Trees For Life after reading about the Moringa tree on the Trees For Life web site. We at Trees For Life were happy to share what we had learned about the Moringa tree and what we were doing to encourage the utilization of Moringa to fight malnutrition and assist individuals and organizations world-wide in achieving their economic, social, and environmental goals. Since that time, James has made the Moringa tree one of the most important species he hopes to plant and establish in Haiti. 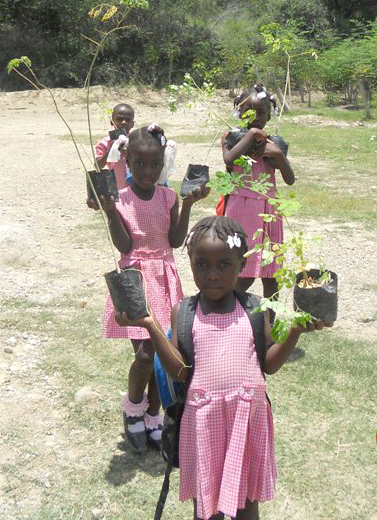 Students taking their Moringa trees home. According to James, over 900 students and teachers . 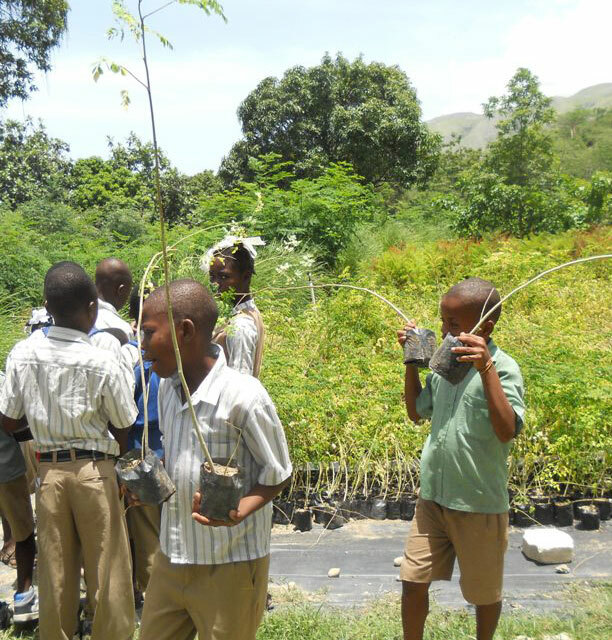 . . from 3 different schools participated in the Moringa Day events, with some 2,500 Moringa trees distributed! He used Trees For Life’s Moringa informational pocket brochure and is presently working on a Haitian Creole translation for the material. 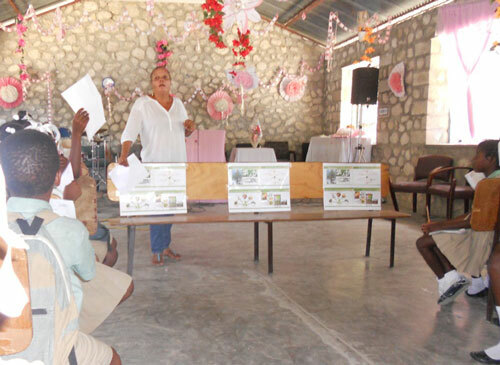 Trees For Life is pleased to have been able to contribute to efforts at afforestation and bio-diversity in Haiti and we are proud of the success of Moringa Day. We applaud the hard work and dedication of James Kishlar and ARN and hope that we may be of help in whatever way we can in the work of re-building Haiti and empowering Haitians as they create the future of their country. Trees for Life has spent over twenty years promoting the use of Moringa tree leaves as a way to reduce malnutrition worldwide. Another use of the Moringa tree is the seeds as a flocculant; the seeds, when crushed, clump together small particles and pollutants in unpottable water. Read about this young scientist who has created a low-cost water filter using Moringa tree seeds as a part of the process of filtering water. Meghan Shea, 18, from West Chester, Penn., holds up a water filter that uses seeds from Moringa oleifera tree that releases a protein that clumps together pollutants, making it easier for charcoal and fabric to capture. A high-school senior has built a simple water filter using a common tree seed that can effectively remove bacteria such as E. coli and other pollutants. Distributing the easy-to-follow instructions on how to build the filter to developing countries could potentially save lives, she said. “For people who are currently drinking contaminated water and don’t have access to another (filtration) method, I think this is really a step in the right direction,” Meghan Shea, an 18-year-old student at Unionville High School from West Chester, Penn., told NBC News. Shea built a prototype of the filter for the Intel Science Talent Search, and was selected as one of 40 finalists convening March 7 through 12 in Washington, D.C. The annual competition identifies some of the nation’s most promising young scientists and innovators. The finalists were narrowed down from 300 semifinalists and more than 1,700 entrants from around the country. Participants in the 72-year-old competition have gone on to win seven Nobel Prizes and 11 MacArthur Foundation Fellowships, among other honors. Shea was inspired to build her filter after reading about the seeds from the Moringa oleifera tree, which release proteins when immersed in water that cause particles to clump together. The clumps, in turn, are easier for other filters such as charcoal and fabric to capture. “They sounded like the perfect solution for water purification in areas without access to more sophisticated resources, because the tree happens to grow in a lot of regions where potable water is very scarce,” she said. 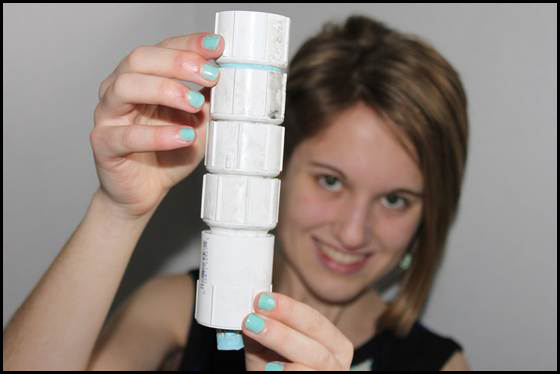 Her solution is a filter system made out PVC piping or any other material with interlocking segments, such as widely-available bamboo. Each segment contains a filter element — in her prototype, it’s soil followed by charcoal followed by fabric. The crushed seeds go in the top segment, which causes the pollutants to form large enough clumps for the other segments to capture, Shea explained. “It is essentially using materials that aren’t normally effective and coupling them with these seeds so they become effective,” she said. Shea proved the effectiveness of the filter with discolored lake water and water she spiked with E. coli bacteria. It worked. Shea aims to convince non-profit organizations currently building large-scale filtering devices in communities in need of potable water or distributing individual filters such as LifeStraw to distribute instructions on how to build her filter. Shea herself is headed to college next fall where she aims to continue studying environmental sciences and pushing for her filter design to reach its full potential. Her focus on environmental sciences is a shift from a childhood fascination with sea horses and determination from age four to pursue a career in marine biology, though Shea said she is keeping an open mind to the myriad possibilities of a career in the sciences. Support the work of Trees for Life to eliminate hunger and illiteracy in the world. 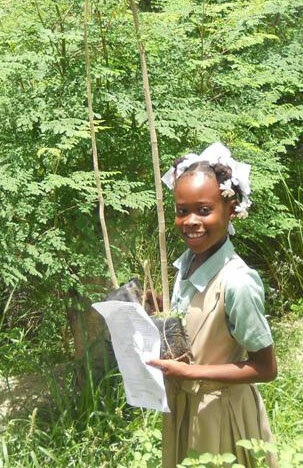 What can two Texas 4th graders do to spread the word on the benefits of the Moringa tree? Why just about anything they can think up! Lanna’s QUEST teacher asked the class to come up with their own way to help, so she and her friend Shivani had a fundraiser! 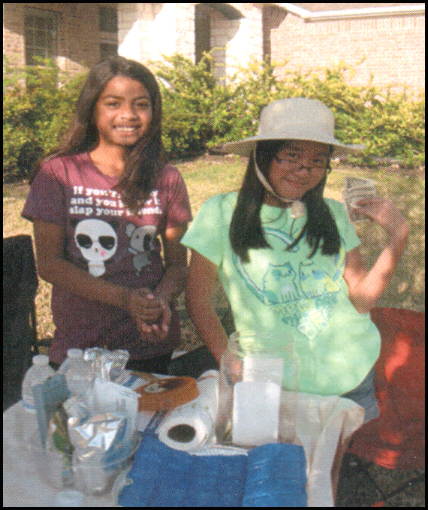 They sold candy, juice and cookies, raising $40 to help spread the awareness of the health benefits of the Moringa tree as far as Africa, Malaysia or Central America! Great job, girls! From January of 2012 up till the beginning of June, Trees for Life staff had multiple email exchanges with a young Nigerian named Francis Olaniyi. At that time Francis was half way into a year long project of working on MORINGA sensitization through out Nigeria. It was kicked off in Pil Gani community in Plateau State where there are lots of Moringa trees. His was a year of volunteering through the Nigerian National Youth Service. Our initial response was to determine in what ways Trees for Life could be helpful to Francis in his plans to spread awareness about this remarkable tree. We learned that Francis was an accounting graduate from Obafemi Awolowo University in South-West Nigeria. “What I love most is touching lives positively, and want to spread the good news of Moringa to as many as possible, educate rural dwellers……curb poverty, reduce malnutrition…..and improve material health. Also, to educate the government, NGOs and others and get them involved in using Moringa to better peoples’ lives with a focus on children, youth and women.” We couldn’t have said it better ourselves! Francis continues, “Futhermore, I am currently coordinating the MORINGA LOVERS project and working with other volunteers, community heads, farmers, secondary & primary school students and several youth and women’s groups.” These goals are all a part of his one-year time of service! To assist Francis, a variety of printed materials were sent to him to use in creating his own translations in the Hausa language. He felt this would further encourage more cultivation, use and commercialisation of Moringa in the rural communities. Three weeks after shipping the materials, Francis confirmed their arrival. Francis said he has plans, now that he is finished with his National Youth Service Corps year in Plateau State, to move to the southern part of the country, but Moringa awareness continues strongly in his future. Francis’ story is not quite yet over! In July we were told he would be sending two copies of an educational booklet that he had written entitled: MORINGA Lovers – An Adventure of Corper Zogale (Corps Member Moringa – one who educates others about Moringa). We are amazed by all that Francis accomplished during his year of service! A true inspiration to others. The following are photos taken by Francis of his work with Moringa tree planting. Be a part of the solution to malnutrition worldwide. Fabiano saw the Trees for Life website and read about the Moringa tree. He had already been growing this nutritious tree and donating saplings to local farmers and families. The Moringa tree leaves are nutritious and can be used as a supplement for people suffering from malnutrition. He wanted a Moringa poster to help educate the community, but didn’t want us to spend money on sending it to him, so we sent him the graphic file. Here is what the poster looks like: Moringa poster. on the translation of the Moringa Book into Portuguese. “Ill try to explain my work with the moringa ok? But, sorry, because I don’t know English very well. Just my intentions are bigger with moringa than my English. LOL. I’m very happy too because I’m having good results with moringa here in Rondonopolis – MT, Brazil. I’m cultivating it as you can see from the pictures that I’m sending. I put the seeds in the ground on December 27, 2011 and on December 31, 2011, they started to grow. I took the pictures with my twin brother on January 15, 2012. You can see they have grown more than 30 centimeters (12 inches) in just 15 days. My twin brother and I made donations of seeds for farmers that I know (some friends, some friends of my friends…). See the small plants in the picture below. I’m donating to a village of 100 local farmers. I will wait one year for moringa to grow and start flowers and new seeds. Then I can have enough for the city here where I’m living and maybe for other cities around. I’m the webmaster too. Here is my website: http://www.cidadaosolidario.org.br/Moringa.aspx to help explain Moringa to the people. Now, I’m studying Psychology at school and I intend to help people with nutrition and psychology, too – helping other people and make a good world. When I have more results, I promise that I will pass more information for you. It’s very great to have friends like you, across the world.